Sample pouches, back and front. Pouches are hand-painted and designs vary; one pouch per set. The Sisters of St. Francis have taken pictures of the Canticle sculpture (inspired by St. Francis’s well-known Canticle) and I’ve had them made into notecards. Each card highlights a symbol from the artwork with a reflection to contemplate. 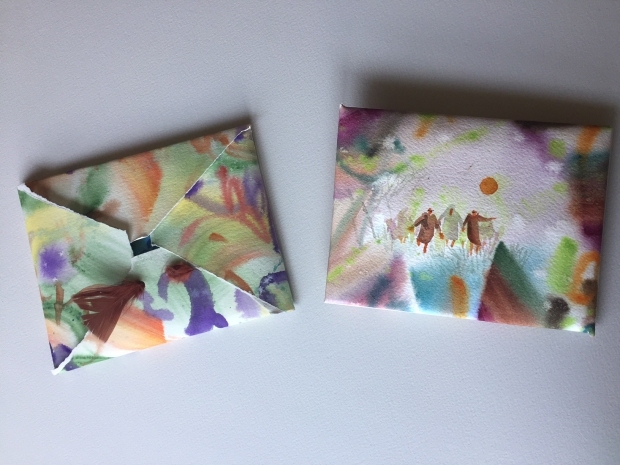 The cards are sold as a set of 8 with envelopes (one of each design), bundled in a watercolor-paper pouch (pouches painted by me or by my able assistants!). 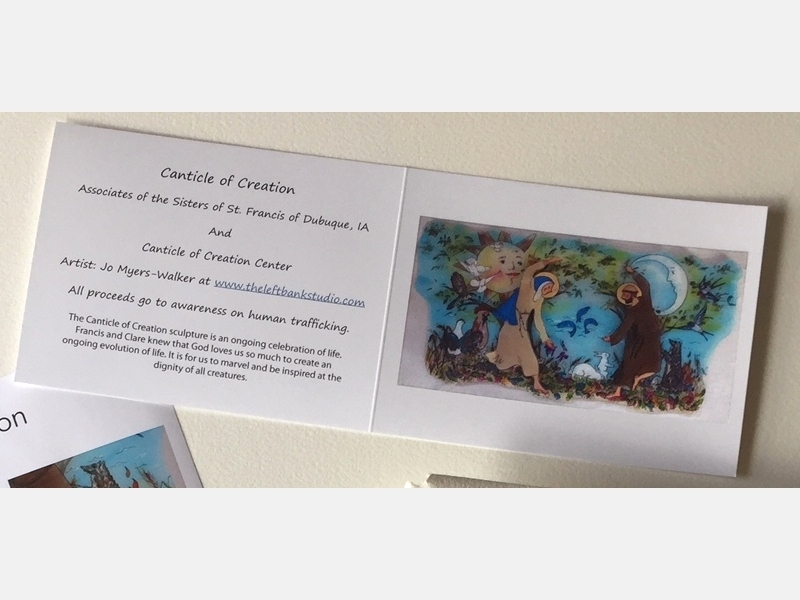 Proceeds from sale of the cards will go toward awareness of human trafficking, starting with support for Lila Mae’s House (link is to a Sioux City Journal article; note the “Ways to help” and “Signs of human trafficking” in the left-hand column). Update: We’re making a new style of pouch for the Canticle cards, representing the Portiuncula chapel restored by St. Francis. The updated design sheet (PDF) linked below has a sample. Please contact me (email jomyerswalker@gmail.com) if you’d like to join in painting pouches (ages 12 to adult). See the Creating for a Cause page to see all the notecard designs (including the separate Abundant Homes set), plus scarves and bags! Update April 2019: You can order Creating for a Cause products online at Shop for Lila Mae’s House (external website). River to River episode about human trafficking from Iowa Public Radio (article and podcast). Sister Shirley Fineran, founder of Lila Mae’s House, is one of the guests, along with a survivor of human trafficking and a former investigator.